Even as there was some respite from the incessant rain and hailstorm in the lower belt but normal life continued to remain paralysed for the third day today as electricity and water supply in many parts of the state remained severely affected. Belated snow and rain has brought cheers to apple growers who were facing a second consecutive crop failure in the wake of a protracted dry spell. The district unit of the BJP today held a protest demonstration here against rising prices of essential commodities. The Solan police arrested one Pawan Goyal, in charge of a private girls hostel — Bhartiya Aadim Jati Sewak Sang — from Salogra last evening on charges of outraging the modesty of a girl and criminal intimidation. He was produced in a local court today which remanded him in police custody till February 15. Three persons were buried alive under an avalanche and three others were injured at Hudan Bhatori, a remote tribal village in Pangi valley of the district, Resident Commissioner (RC) of Pangi Gopal Chand said today. A large number of candidates have resented the “goof in essential qualification in the advertisement published by the HP Public Subordinate Service Selection Board (HPPSSSB), Hamirpur, for the posts of laboratory assistant (serology and biology) in the State Forensic Science Laboratory (SFSL) under the home department. Central University Vice-Chancellor Furkaan Kumar today visited the district for the first time and inspected the sites for setting up temporary campus for the proposed institution. He, along with officials of the district administration including Deputy Commissioner RS Gupta, inspected the sites proposed by the government in the Jawalamukhi area. Several social and voluntary organistions today demanded a judicial probe to ensure strict action against the guilty in the alleged molestation of inmates of a tribal hostel for girls at Salogra near Solan. The Himachal government has reconstituted the state-level coordination committee for the disabled to review implementation of the Persons with Disabilities (Equal Opportunities, Protection of Rights and Full Participation) Act, and to provide guidance and instructions in this regard. A herd of about 20 sheep and goats fell prey to a leopard which was on prowl at Jalaar village in the interior part of Salooni tehsil in the district last night, according to a report received here today. Union Steel Minister Virbhadra Singh has urged Union Railways Minister Mamata Banerjee to provide online booking facility at the Jogindernagar railway station. It is after two days today that power supply in the state capital was partially restored but water supply remained disrupted as heavy silt levels at the sites of the water supply schemes prevented pumping. Irrigation and public health officials said hopefully by tomorrow pumping would be possible in case there is no fresh spell of rain. Power supply in many parts of the tribal districts of Kinnaur and Lahaul-Spiti and Shimla remained affected as employees of the electricity board were still engaged in restoring supply. Surprisingly, despite Shimla not getting any snow, power supply has been affected for the past two days with residents facing a lot inconvenience. Even as electricity authorities attributed the failure to fault in the Junga sub-station but supply in practically the entire town was paralysed. The local Meteorological Centre issued a warning for the tribal belts of Kinnaur, Lahaul-Spiti, Chamba and higher reaches of Kullu and Mandi where there is possibility of moderate to heavy snow during the next 24 hours. “There is likelihood of rain and thundershower in the middle and high hills on February 12 and 13,” said Manmohan Singh, director, Meteorological Centre. Vehicular traffic to Kinnaur and Rampur via Narkanda could not be restored as attempts to ply buses proved unsuccessful as the vehicles got stuck in the snow. Traffic to Rohru and Jubabl via Khara Patthar and to Khirki via Chopal could not be restored due to heavy snow. Buses have, however, been redirected through Basantpur for Rampur and through Vikasnagar in Uttarakhand for Jubbal-Rohru. Snow continued to fall in the higher reaches of the state with 7.3 mm snow at Kalpa and 10 mm at Keylong. 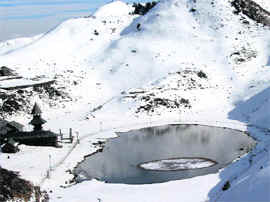 The minimum temperature in Shimla was recorded at 0.3 degrees Celsius, Sundernagar- 2.2, Bhuntar- 1, Kalpa - minus 11, Dharamsala- 2.5, Una- 3.4, Mandi- 5, Nahan- 7.6, Keylong- minus 12.8 and Palampur- 2. The entire apple belt in the state has received snow in abundance during the past three days, raising hopes of a good crop after last year’s lean season. The lower elevations recorded about 30 cm of snow, while higher hills, which account for the bulk of production, had 60 to 90 cm. The weather gods have come to the rescue of the growers in the nick of time as mercury had started shooting up towards the end of January and if the trend had continued, the requirement of minimum chilling hours would not have been fulfilled. The temperature has plummeted sharply following widespread snow and the chilling period will be extended by almost a fortnight. As a result, the risk of early bud-breaking and flowering has been obviated to a large extent. It will also ensure that the orchards are not subjected to wide temperature variations after flowering which affects fruit setting, explains Dr SP Bhardwaj, former joint director (extension), Dr YS Parmar, University of Horticulture and Forestry. Last year, the Shimla region, which accounts for almost 75 per cent of the total apple production, virtually experienced a snow-less winter. Its impact was visible in the sharp decline in production which came down from 2.56 crore boxes in 2008 to 1.40 crore boxes in 2009. The procurement, under the market intervention scheme, has been only 913 tonnes as compared to 45,500 tonnes last year. The orchards in lower elevations were the worst affected as the soil was devoid of moisture due to lack of snow. Leading apple producer Rajiv Chauhan is happy that the parched earth crust in the orchards had finally got some snow which will not only restore soil moisture, but also recharge the water sources. With snow and rain becoming increasingly scarce, active water sources are required to provide irrigation during summer. The local weather office has predicted more rain over the next couple of days and if it comes through, the outlook for crop will further improve. The farmers are a relieved lot as lack of rain during winter would have meant third crop failure in succession. Party activists marched through the bazaar here shouting slogans against the Congress-led UPA government, holding it responsible for the steep rise in the prices of essential commodities during its regime. Later, they also held a public meeting at Gandhi Chowk, which was addressed by district president of the BJP Desh Raj Sharma, chairman of the Kangra Central Cooperative Bank Raseel Singh Mankotia and president of the district marketing board Pyare Lal Sharma. Addressing the rally, the BJP leaders castigated the UPA government for its failure to control the prices of essential items. They said due to rising prices of commodities life of a common man had become miserable and it had become very difficult to meet both ends. Drawing a comparison between the previous Vajpayee government and the present government, they said while prices were static during the NDA rule they have skyrocketed during the Congress rule. The party also brought out a comparative list of prices of many essential items prevailing during the NDA and the UPA regimes. Demanding an immediate check to rising prices the BJP leaders also highlighted the failure of Prime Minister Manmohan Singh, despite being a renowned economist himself, which only proves his alleged lack of commitment to the issue. MANDI: After the CPM-CPI’s protest against the state and central governments over the price rise, the district BJP anti-price rise protest here led by PWD Minister Gulab Singh Thakur and president Dile Ram on Wednesday turned out to be a mere formality. There were only a few BJP activists who turned up for the protest in front of the DC office. They shouted anti-Congress and anti-UPA slogans and blamed price rise on the Congress-led UPA government. Thakur, Dile Ram and other local BJP leaders went inside the DC office to submit a memorandum to the President of the India through the DC. However, the BJP activists, including leaders of the district mahila morcha kept waiting for the leaders, but they dispersed after 15 minutes of waiting. Insiders revealed they sat with the DC and had a cup of tea, but Dile Ram denied this. Mandi Sadar BJP leaders when questioned said the protest was the part of countrywide BJP protest against price rise. The matter came to light when one of the inmates, a resident of Pangi village in Kinnaur district, aged 14 years and a student of class VII, made a complaint to the CID, Shimla. The girl was under mental trauma as she had fallen ill after being molested by Goyal. She was later referred to the IGMC, Shimla, where she was undergoing treatment. Acting swiftly following receipt of information from the CID, a team of Solan police, led by SP Prem Thakur and DSP(headquarters) Narvir Rathode, raided the Salogra-based hostel and arrested Goyal after five girls present on the occasion corroborated the charges levelled on the latter. Thakur said the hostel was being run by a Delhi-based NGO and Goyal was appointed its in charge about two years back while his wife Kiran was the warden where 31 tribal girls from Kinnaur and Jharkhand were staying. They were studying in the nearby government senior secondary school. Since the school had closed for the winter vacation, only five girls, aged 12 to 14 years, were present there. The police inquiry revealed that the girls were forced to massage Goyal, who not only made advances towards them, but also indulged in other objectionable acts with them forcibly. Refusal by the girls led him to intimidate them and he threatened of throwing them out of the hostel if they protested. He even forced the girls not to draw the curtains of their two dormitories and often sneaked into the rooms. The police officials added that his wife Kiran had admitted that he was taking massage from the girls though she refused to say further. An intimation had been given to the trust’s Delhi-based chairman Banwari Lal and its secretary Sham Manohar. They will be coming here to take stock of the situation while the police has posted a lady constable to take care of the girls till an alternative arrangement was made. The police has registered a case under Sections 354 and 506 of the IPC and Section 3(1)(10) of the SC/ST Act. The RC said the deceased had been identified as Amar (56), Prem Raj (20) and Ram Singh (7) while the injured included Lakshmi Devi, Inder Pal, Tashi Ram. However, all six belonged to one family. Six houses were completely destroyed by snow avalanches and seven houses were partially damaged, the RC said; adding that inhabitants of the village had been cautioned to stay at the safer side of the village. Since the tribal valley had unprecedented heavy snowfall measuring 30 cm at Killar, it has become arduous for rescue parties to reach the affected village, the RC said. He said the road leading to Hudan Bhatori village was also not visible owing to heavy snow in the valley. However, efforts were being made to reach the site of the incident. However, officials deployed to rush to the incident site to take stock of the situation are trying their best to trudge a distance of 20 km to reach the village which is situated at an altitude of more than 10,000 feet, the RC added. A relief of Rs 1 lakh each has been sanctioned to the next of kin of the deceased, the RC informed. On the other hand, an official from Bharmour tribal subdivision informed that a cluster of 10 shops had been burnt to ground as a result of lightning last evening. A tentative loss caused to these shops had been put at more than Rs 50 lakh, the official informed; adding that an immediate relief of Rs 5,000 each had been disbursed. What has come as a shock to both candidates and insiders in the SFSL is the fact that the board has asked only “eight candidates to appear for the direct interview for five posts fixed for February 12”. Besides, the HPSSSB did not conduct the test as there were only eight candidates for five posts, insiders revealed. The degree holders felt cheated by the “misleading advertisement” which did not spell out the essential qualifications for the laboratory assistants in clear terms. Even insiders in the SFSL have expressed shock over the misleading information. “The essential qualification in recruitment and promotion rules meant for the laboratory assistant have kept the information not clearly spelt,” they said. According to the HPSSSB’s advertisement published on August 28, 2008, (a copy of which is in possession of The Tribune), the home department had sought applications for the five posts of the laboratory assistant (serology and biology) along with other posts of scientific assistant in the SFSL. The essential qualification for the lab assistant stated in the advertisement was “BSc (medical) in Molecular Biology/Bio-technology from a recognised university”. HPSSSB secretary HR Sharma, when contacted, said the board had not received any complaint so far. He said the board had no role as they advertised the posts after getting requisition from the home department. The VC was shown the Yatri Nivas and land site near Jawalamukhi truck union for starting temporary classes of central university starting this academic year. The government has proposed over 500 acres land near Dehra for setting up the university. However, since no suitable building was available in the Dehra area, it was proposed that the classes should be started in the Jawalamukhi area. The VC, in a brief talk with mediapersons, said he was here to inspect the building for starting temporary campus of central university. A team of the Union Ministry for HRD would be visiting the area in the near future for identifying the site at which the campus of university would come up. It would then submit its report to the Union Ministry for HRD, he said. The visit of VC has once again kindled the tug of war between Congress and BJP leaders over the place where the university is likely to be brought up. While the majority of Congress leaders, but for party MLA from Pragpur Assembly constituency Yog Raj, are for setting up the university campus at Dharamsala, the senior BJP leadership, including Chief Minister PK Dhumal wants it for Dehra area. The All-India Democratic Women’s Association (AIDWA) demanded a judicial probe into the incident, preferably by a woman judge, so that the guilty was punished. “The government must ensure speedy justice as it is often seen that with the passage of time, the case is diluted and the guilty goes scot-free,” said Falma Chauhan, vice-president, AIDWA. The Akhil Bhartiya Vidyarthi Parsihad (ABVP) and Students’ Federation of India (SFI) too held demonstrations against the incident outside the deputy commissioner’s office. “The fact that most such cases are being up and the guilty being spared, there has been an increase in such cases of exploitation of girls, especially those from the weaker sections,” said Rajender Sharma, ABVP leader. SFI leaders too castigated the authorities for their failure in taking stern action against those indulging in such heinous acts, which had resulted in more such cases taking place. They said the authorities had failed to learn a lesson from the a similar incident that took place last year where hearing and speech impaired girls at an institute on the outskirts of the state capital had been exploited. Headed by the Minister-in-Charge, Social Justice and Empowerment, the committee will have Virender Kanwar, Chief Parliamentary Secretary, Renu Chadha, MLA, Principal Secretary (Education), Principal Secretary (social justice and empowerment), Principal Secretary (finance), Principal Secretary (training), Principal Secretary (public grievances redressal), Principal Secretary (health), Principal Secretary (RD), Principal Secretary (housing), Principal Secretary (industry), Principal Secretary (urban development), Principal Secretary (labour and employment), Principal Secretary (science and technology), Secretary (personnel), Labour Commissioner, Director (technical education), and MD, HRTC, will be members of the committee. Malvika Nadda and Ajay Shrivastva, both from Himachal University, Vatsla Joshi, Shimla, Rasil Singh Mankotia, Hamirpur, Uma Baldi, Shimla, and Rajesh Sharma, Shimla, will be the non-official members and director, social justice and empowerment, will be the member secretary. The report confirmed that leopard attacked and killed the livestock in a cowshed, which included 12 sheep and eight goats in the village. However, the panic of the leopard was still prevailing among the villagers of the area who remained indoors most of the time. Officials from the Salooni tehsil headquarters rushed to the site to take the stock of the situation and provided relief to the affected family, the report revealed. Virbhadra Singh met Banerjee at New Delhi today and brought to her notice the fact that Jogindernagar was the terminal point of the narrow gauge track originating from Pathankot and served a large area. Besides, the facility of online booking will especially benefit the service personnel who mostly travelled by rail, he added.